Ardelyx is focused on enhancing the way people with cardiorenal diseases are treated by developing first-in-class medicines. Ardelyx's cardiorenal pipeline includes the Phase 3 development of tenapanor for the treatment of hyperphosphatemia in people with end-stage renal disease (ESRD) who are on dialysis, and RDX013, a potassium secretagogue program for the potential treatment of high potassium, or hyperkalemia, a problem among certain patients with kidney and/or heart disease. In addition, Ardelyx has completed Phase 3 development of tenapanor for the treatment of irritable bowel syndrome with constipation (IBS-C) and submitted a new drug application, or NDA, to the U.S. Food and Drug Administration, or FDA, for the treatment of patients with IBS-C which has been granted a target action date under the Prescription Drug User Fee Act (PDUFA) of September 12, 2019. To efficiently bring its treatments to market, Ardelyx is pursuing strategic collaborations for tenapanor for IBS-C and hyperphosphatemia in certain territories. Ardelyx has established agreements with Kyowa Hakko Kirin in Japan, Fosun Pharma in China and Knight Therapeutics in Canada. For more information, please visit http://www.ardelyx.com/ and connect with us on Twitter @Ardelyx. We are currently seeking a Clinical and Manufacturing Finance Manager to join our Finance and Accounting team, reporting to the Corporate Controller. The position will provide support for the Finance and Accounting team with primary focus on clinical trials and manufacturing. Responsibilities include clinical and manufacturing accrual support, monthly budgeting and reporting (including monthly budget versus actuals variance analyses), and long-range financial planning for clinical and manufacturing. 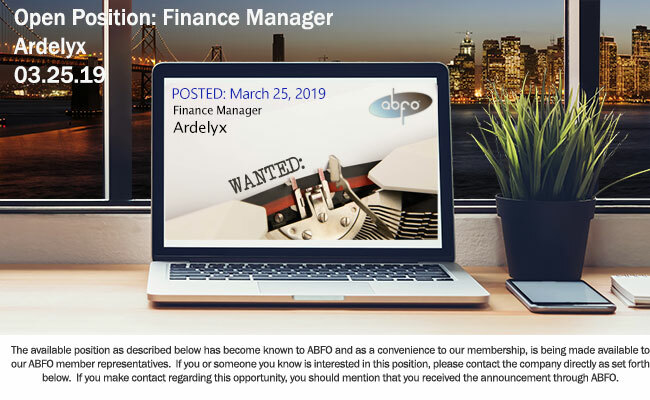 The position will also play a key role in helping to build and establish financial processes and best practices as the Company continues its growth. Prior experience in public accounting or similar role is desired. Experience in the life science industry is preferred. Maintain existing and set up new accrual models for clinical trials, monthly. Incorporate changes in contracts, timelines, patients’ enrollment data, and site activity data into the models, monthly. Ensure high quality of models with attention to detail, robustness, and accuracy of calculations. Own the development and maintenance of the manufacturing accrual models. Ensure that all material contracts are modeled and timelines are updated, monthly. Compare the actual cost of the individual clinical trials with the budget and explain variances monthly to management. Investigate the key drivers of variances in the actual cost compared to the budget and explain the variances to management, monthly. Develop the three-year forecasts on a quarterly basis for clinical and manufacturing together with the FP&A, clinical and manufacturing teams. Work collaboratively with internal financial stakeholders and business partners to establish the processes necessary to accurately monitor Clinical and Manufacturing spend against budgets and operating targets. Recommend and implement process improvements and best practices.